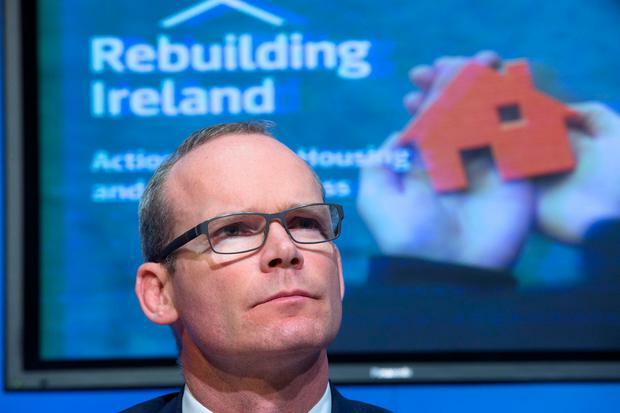 Some 4,000 vacant and derelict homes will be brought back into use under a €215m package to be announced by Housing Minister Simon Coveney today. The Irish Independent has learned that €140m will be earmarked for a 'repair and lease' scheme designed to bring 3,500 vacant units back into use. Meanwhile, local authorities will be given €75m in 2017 and 2018 to buy and refurbish derelict properties in town centres. The initiatives are part of the 'Rebuilding Ireland: Action Plan for Housing and Homelessness' scheme aimed at boosting output. They form part of Pillar 2, which deals with provision of social housing, and will be formally announced this morning. The new repair and leasing scheme (RLS) will provide funding to landlords to repair vacant and unused homes, and make them available for families on local authority waiting lists. The scheme will initially operate in Waterford and Carlow, and some 150 units are expected to be delivered this year. It is designed for people who may have inherited properties, or who own vacant units, but cannot afford or access the money necessary to bring them up to the standard required to rent. The cost of repairs, which is likely to be up to €30,000, will be met upfront by the local authority or an approved housing body (AHB), and in return the landlord will enter into a leasing arrangement of at least 10 years. The cost of repairs is offset against the agreed rental income over a period of time. Owners can choose to arrange a contractor to carry out the repairs, or the council or AHB will arrange the works, and they will also manage and maintain the property during the rental period. Some €140m is available over the next five years, and the Government believes at least 3,500 units will be brought back into use. Some €6m has been allocated for 2017, which rises to €36m in 2018. Two other initiatives are also being announced. The first is additional funding to bring council-owned stock, or 'voids', back into use. Details of funding are not known, but 'several hundred' units are expected to be upgraded. The second is a 'buy and renewal' scheme where €25m will be provided in 2017 and €50m in 2018 for councils and AHBs to purchase and upgrade homes and make them available for social housing. Some 150 units will be delivered in 2017, and 300 in 2018. Town centres will be prioritised, to aid regeneration, and councils can also use CPO powers to acquire units in need of works. Sources said there was a "real challenge" in the works, as upgrading vacant or derelict units could be difficult and costly. But part of the appeal is that councils can tackle dereliction, while also avoiding competing with private buyers for good quality housing stock. The net result of both initiatives is that councils or AHBs can approach owners of vacant homes in need of works and offer to repair and lease the unit, or buy and upgrade the property. Further details will be announced today, including an update on the number of social houses under construction.